So Star Kat here is wearing shorts. So what? She's allowed to wear shorts when she's representing in the JUNGLE isn't she? Word to the motherfather, she is. She fancied a one to one with Predator just to see if he was as tough as they say, but it turns out he's gone so far downhill even Adrian Brody can take him now, and Adrian Brody's about as tough as my niece. Anyway, I digress, Star Kat is showing dedication to the Dark cause here, so I salute her. Unless this photo was taken in Kew Gardens, in which case she's a filthy cheat. 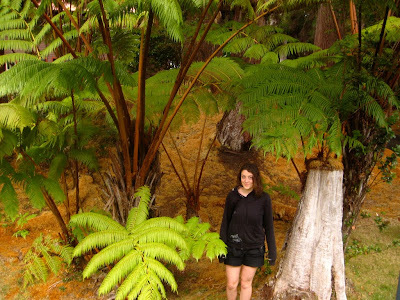 She looks so tiny beside those tree-ferns! Also, I am so getting myself and my little horde dressed up and posing us all in front of assorted ferns and tropical plants someplace when my camera's working again. When that time comes, know that you shall be afflicted by a flood of photos similar in nature to this one, but more crowded.